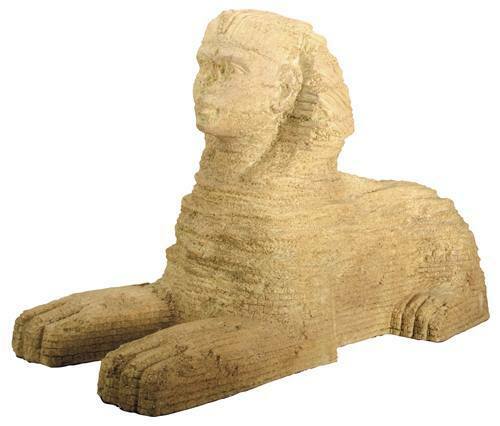 This resin statue represents the Sphinx as seen on the Giza Plateau today - complete with missing nose and restoration blocks along the base. Proud monument of a civilization that has long since disappeared, the great pyramid was one of the Seven Wonders of the Ancient World. Ancient Egyptians saw the pyramid as the primal hill, the creator’s birthplace and throne. It’s golden capstone was their point of contact with the Gods. According to current archaeological belief, the pyramid was built as a funerary tomb for Pharaoh Khufu (Cheops in Greek) but the only funerary element that remains is a stone sarcophagus, and no sign of a mummy or other funerary elements has been detected. Covering 13 acres, it contains 2.3 million blocks of limestone ranging in weight from 2.5 to 15 tons stacked to a height of 481 feet for the original pyramid which now stands at 450 feet high. Before the outer limestone blocks were stripped, each side measured 755 feet, now 746 feet. The great pyramid was built with an extraordinary array of mathematical and astronomical measurements that required advance scientific knowledge. The building effort must have been monumental for that epoch and probably took place over an extended period of time. Cold cast resin with sandstone finish, it is 9 1/2 inches high. Resin is a polymer which can be used for making molds as well as cast in molds. Cold-cast resin is generally for sculpture and means that the resin material is cast without the need for the extreme heat of a foundry. It holds very sharp detail when cast. Most of the major lines of figurines on the market today are made of cold cast resin. It is fragile if dropped and fractures similar to glass, usually in clean pieces which can be glued using a household super glue.